This long sleeve work shirt is a color match with many of the Dickies work pants and offers a generous fit across the shoulders and sleeve length. 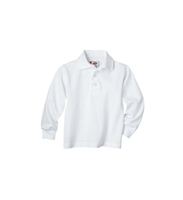 Dickies Adult Size Long Sleeve Polo features unisex styling for men and women. Rib knit collar and taped neck for comfort.